This Vanilla Chia Seed Pudding with Raspberry-Cashew Cream uses six simple ingredients and minimal preparation. With endless topping options, this is the perfect quick dessert or even breakfast! 1. Place cashews in a bowl and cover with water. Place in the refrigerator for at least 3 hours. 1. To prepare the pudding: Whisk together chia seeds, almond milk, vanilla extract and stevia. Let sit for 5 minutes and whisk again. Let sit for 10 minutes and whisk again. Cover and place in the refrigerator for at least 3 hours. 1. To prepare the cream: Set aside 2 oz. raspberries for garnish. Drain and rinse the cashews. Place the cashews, 4 oz. raspberries, cold water, vanilla extract and stevia in a blender. Puree until smooth. 1. 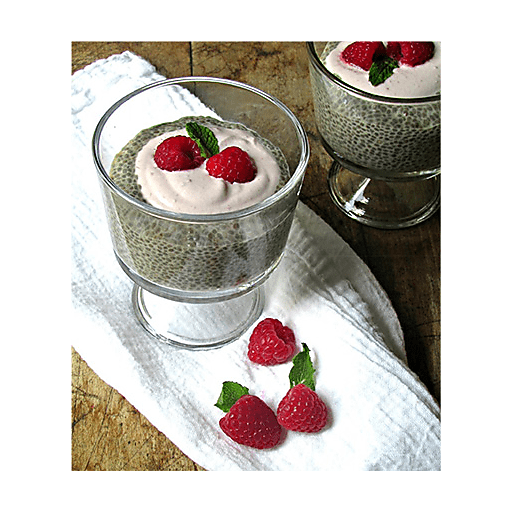 Scoop chia pudding in to dessert glasses and top with raspberry-cashew cream. Garnish with raspberries and enjoy! Per Serving: Calories 160, Total Fat 8g(Saturated 1g, Trans 0g), Cholesterol 0mg, Sodium 65mg, Total Carbohydrate 18g (Dietary Fiber 7g, Sugars 8g), Protein 4g, Vitamin A 4%, Vitamin C 15%, Calcium 20%, Iron 10% *Nutritional values are an approximation. Actual nutritional values may vary due to preparation techniques, variations related to suppliers, regional and seasonal differences, or rounding.